I watched Dumbo recently. You know, the movie about the baby elephant with big ears that (spoiler) learns how to fly? I actually watched it because we had a formal seminar on it at the school I used to attend. It really is amazing how much interesting food for thought there is in almost anything. All it takes is a little conversational digging to get it out. belief in fetishistic magic in order to boost their self-esteem?" The obvious idea or "message" in Dumbo is that what makes someone appear strange or ridiculous might be turned to some good use and, in fact, make one essential, if cultivated correctly. Now, this idea has merits and problems, but I we also brought up a secondary point about the "magic feather", namely that it is a classic Frommian psychological example of idol worship. 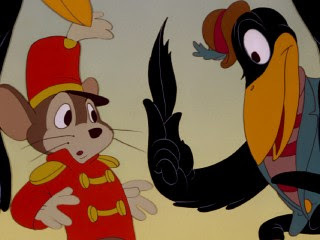 So, when the mouse deceives Dumbo about the feather, he does it specifically to get Dumbo to project his own ability to fly onto the inanimate feather because Dumbo won't believe in his own capacity. The idea is that Dumbo will have an easier time believing some external thing has lent him that capacity. Then, once he has proven to himself that he is capable, he no longer needs the feather as a surrogate source of confidence. It's interesting to reflect on this, because Dumbo is certainly not the only place we see this idea cropping up. The idea being that an effective way to overcome debilitating fear is to fool someone into thinking they have power because of some external thing, when they've had the power all along (The Lego Movie comes to mind). One can understand the theoretical strategic advantage in this method. But Fromm, at least, certainly didn't think idol worship was the behavior of a psychologically healthy individual. Plus, there's the lying and manipulating people to get them to do what you want. Am I ruining a childhood classic by reading too much into it? I prefer to think I'm giving you something intellectually invigorating to do when you're watching movies with kids. I've had at least two people express interest in reading the book and helping me out with it. Now I've just got to track down the application form for doing a "pursuit" at the continuing education organization I belong to and get it filled out and submitted before next month's meeting. Woo!